It’s true I started this grandparenting adventure three years ago with grand dreams of all the wonderful stuff I was going to buy Capt. Adorable. Luckily, his parents — Older Daughter and Best Son-In-Law Ever — knew better. They’ve created a home where the simple pleasures are valued more than the Toy of the Day. 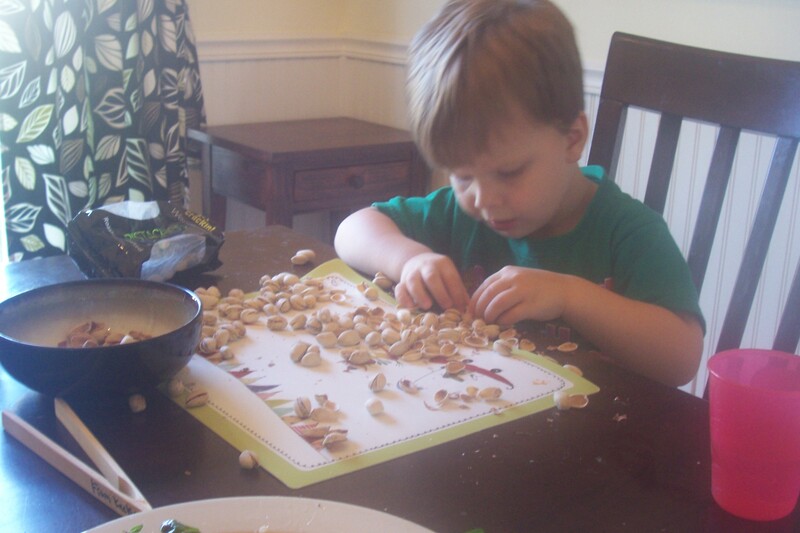 And really, what else does the 3-year-old Captain need for an afternoon of family fun than a $2 bag of unshelled pistachios? At least that’s what I was hoping when that’s the present I brought to their house recently because grandmas always bring presents. And it was a hit on all levels. 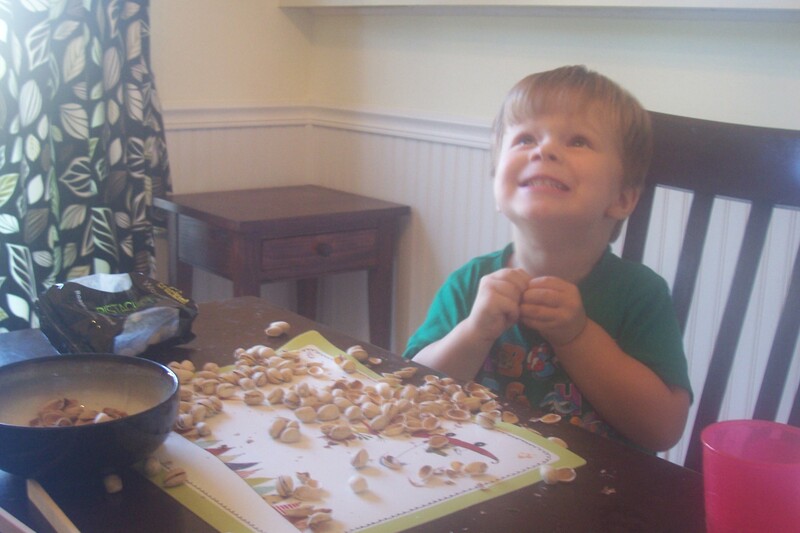 First there’s the joy of bypassing the bowl Grandma Kacky conscientiously set out and simply dumping the whole bag on the table. Then there’s the careful consideration of each nut, carefully assessing its ease of crackability and gauging the likelihood for one or both halves and/or the nut itself to go flying across the room when opened. When it comes to the cracking part, extreme concentration is required — and even sometimes requests for some help from above. Finally, there’s that lovely salty and green-nutty satisfying crunch that makes all that hard work worthwhile. Well … for the Captain, anyway. After going through about two-thirds of the bag, he hops down and is ready for the next adventure — building a pirate ship out of the couch cushions, maybe? — but I have to hurry and find the broom and other cleaning supplies before the Captain’s parents come home and find the huge mess we made so I can impress them with my grandmotherly housekeeping skills. This entry was posted in Alabama, family, food, home and tagged family, food, grandchildlren, Grandparent, Nuts and Seeds, Pistachio, Produce, shopping by Coffee with Cathy. Bookmark the permalink. 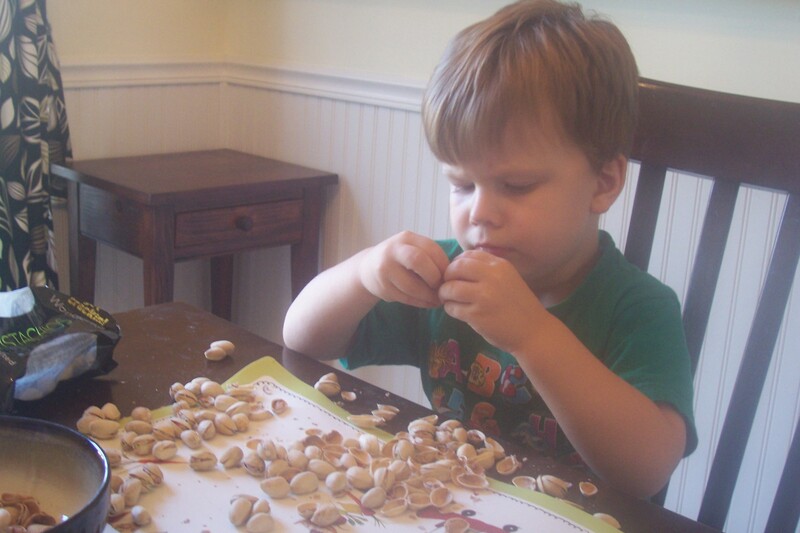 What a beautiful thing to do – honor the parents by not bringing toys – teaching a child the fun of cracking and eating – and having joy while doing it!